Currently, there are three engine configurations available when you're shopping for a Big Bore ATV: There's the single cylinder engine, the parallel twin and the V-twin. There are fairly distinct advantages with each and you may not have really thought much about it. If you prefer the single cylinder "plonker", you'll find, for vibration reasons, the engine displacements of these motors usually don't go beyond 700ccs. These engines are very light, have fewer moving parts and tend to deliver huge torque at low RPM. Some use overhead valves with one intake and one exhaust valve per cylinder (Honda). Some are single overhead cam or DOHC 4-valvers (Suzuki, Yamaha, Arctic Cat) - however, each has the advantage of producing the kind of power that really works well with 4-wheel drive - bottom end grunt and a torque curve that kicks in low and stays strong up through the mid-range! The V-twin, (Kawasaki, Arctic Cat, Can-Am) although a bit more complex and somewhat heavier, shares the single's advantage of being very narrow. This narrowness works well with the limited space available around the footrests on an ATV. Displacements can comfortably exceed 1000ccs and there's less likelihood of having huge vibration issues when the cylinders are firing at 60 or 90-degrees. The parallel twin (Polaris) is a popular choice but needs a counter-balancer when the engine size gets over 500ccs. This usually means extra weight and of course, more complexity with two cylinders instead of one. 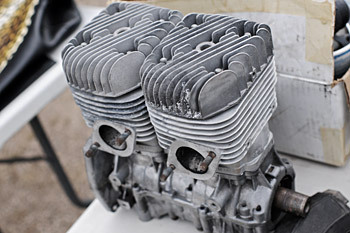 The advantage is that the parallel twin loves to rev and cam timing can be more radical without sacrificing much torque. Some parallel twins are even firing. This means the engine actually works like a big single with both pistons moving and firing in unison. Counter-balancers are definitely used in this configuration. Tough to say one is better than the other - it all depends on what you like in an ATV. Priorities are usually related to weight, power or throttle response. You be the judge.